Until a century ago it would have been unremarkable for New England bakers to use flour that was locally grown and milled. Like making cider from apples grown in the local orchard, it was simply how things were done. Before 1900, nearly 25,000 grain mills dotted the American landscape from coast to coast, including many in New England. But by 2000, there was almost no acreage at all devoted to growing wheat in Maine, once the bread basket of New England. And just over 200 mills remained in the U.S. Today, bakers routinely dip into a big bag of flour made from wheat grown on large Midwestern farms and milled who knows when. It’s simply how things are done. 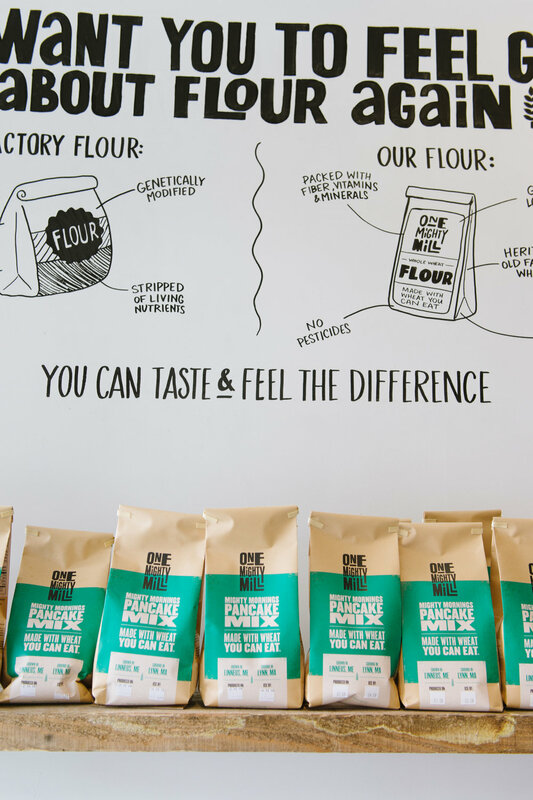 But a pair of businesses that opened in the Boston area in the fall of 2018 are working to make baking with locally grown and freshly milled flour common again in New England. 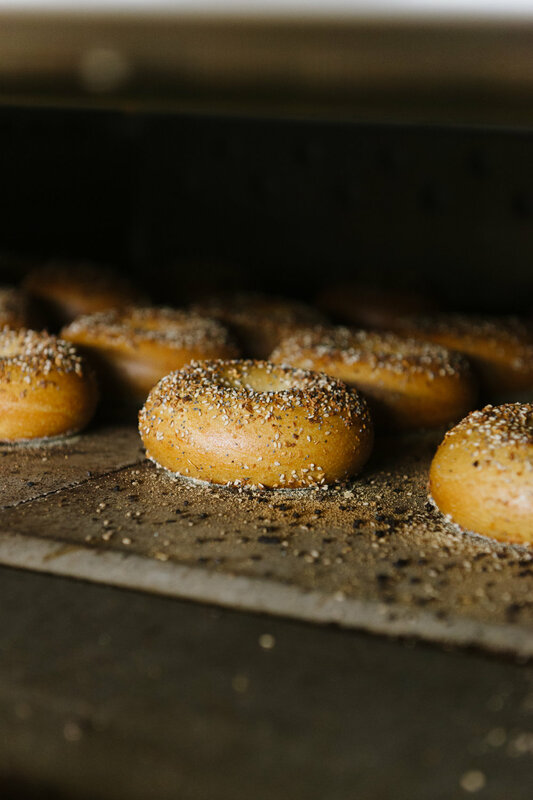 At Lynn’s One Mighty Mill, organic wheat from Aurora Farm in Aroostook County, Maine, is milled on-site and used to make bagels, pretzels, pizza dough and other baked goods that are available on local grocery store shelves. As the company name suggests, the mill itself is the star of the show. A pair of 48-inch Vermont granite millstones, custom-made for the business, work five hours a day to produce flour used for the day’s production. 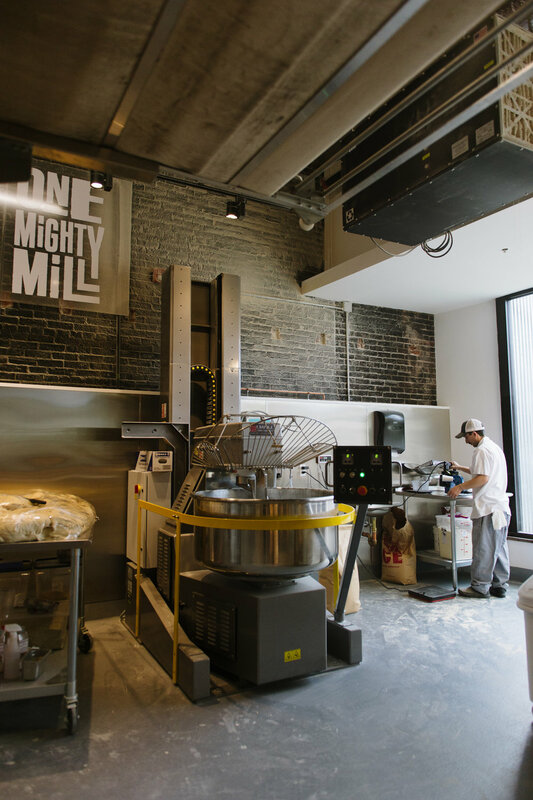 Patrons at One Mighty Mill’s Exchange Street café can watch the mill— and a team of bakers—at work behind giant glass windows that face the street. Part of the stated mission of One Mighty Mill is to bring back local food systems and promote healthier communities, with a focus on grains. The mill processes more than 1,000 pounds of grain every day, making it a significant consumer of New England–grown wheat. One Mighty Mill contracted to buy 120,000 pounds of wheat from its Maine supplier in the first year of business, and doubled that commitment for next year’s harvest. “I know that Massachusetts apples rival any part of the country. Squashes, tomatoes, too. Wheat truly belongs to this area, and always has,” says Tony Rosenfeld, co-founder and head baker. Championing locally sourced ingredients and building relationships with farmers is an approach that Rosenfeld and his business partner Jon Olinto began with their previous venture, B. Good restaurants. “Nearly every town had mills because people couldn’t travel far,” says Matt Williams of Aurora Mills and Farms in Linneus, Maine, who grows wheat for One Mighty Mill. A little over 20 years ago, Aurora became one of the first farms in Maine to begin growing grain once again for human consumption. Now Williams and his daughter Sara, who is shepherding the farm into its next decades, have 350 acres devoted to a mix of wheat, oats, soy beans, rye and more. In addition to providing wheat to One Mighty Mill, the farm has contracts to provide grains to Allagash Brewing Company and rolled oats to Dartmouth College, Boston University and Boston College. Sara Williams says that at this point one of the major challenges facing the farm is scaling up its infrastructure. She notes they recently turned to Canada to purchase holding tanks because regional resources weren’t available. 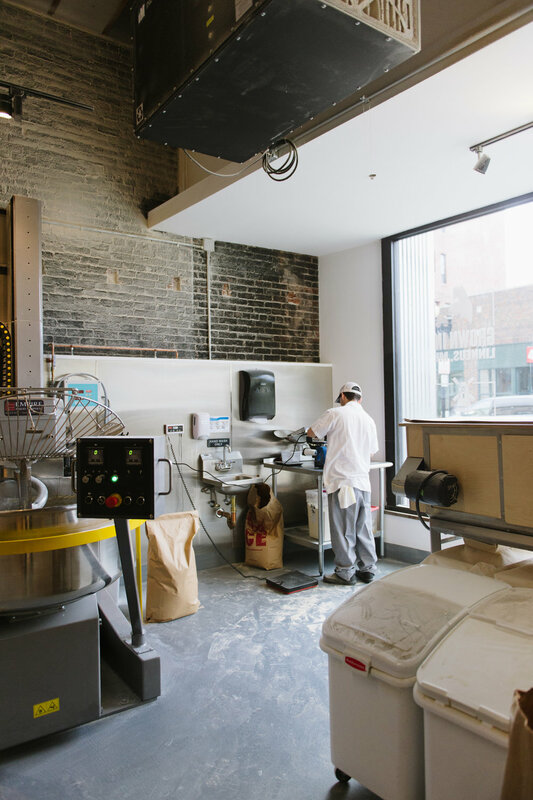 At Elmendorf Baking Supplies and Café in East Cambridge, owners Teddy and Alyssa Applebaum are reintroducing home bakers to a wide assortment of milled-to-order grains, one small bag at a time. The Applebaums offer a variety—Red Fife and Redeemer wheat grown in Massachusetts, heritage varieties of corn from New Hampshire and Aurora Farms rye. The assortment also includes grains such as sorghum grown outside New England. This season’s New England corn is just starting to become available after harvest and drying, a reminder that grains, like other crops, are seasonal. 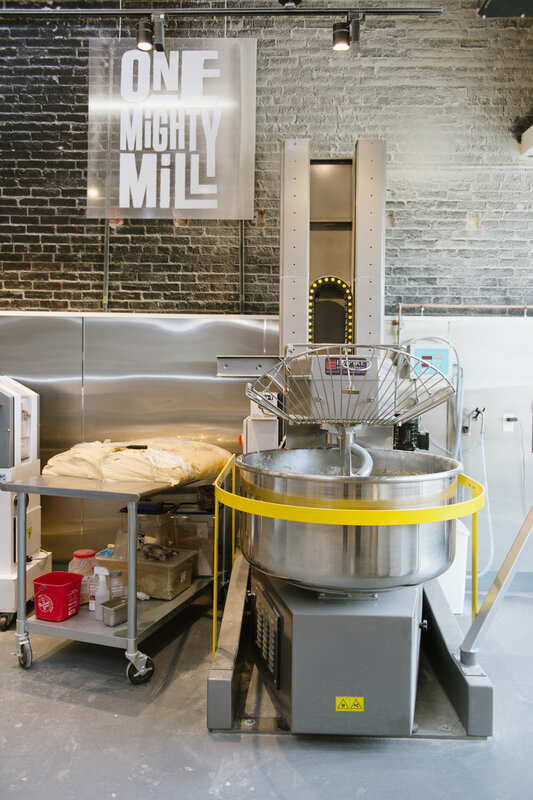 The store’s two tabletop mills, made in Austria, are built to process quantities just right for tonight’s polenta or this weekend’s bread baking—one or two pounds that will be used right away. Elmendorf uses every part of the grain, including the bran and germ, which are generally sifted out of grocery store flour. “There’s a lot of flavor and nutrients in those parts,” Applebaum says. But including the bran and germ means that fresh flour can’t sit on the shelf for months on end. It needs to be used quickly or frozen before the flavor degrades and the oils become rancid. “You wouldn’t make coffee with something that you found on the shelf that was milled nine or 10 months ago. Everybody gets that,” Applebaum says. But it’s still a learning experience for bakers to begin thinking of flour as a fresh and living product. One Mighty Mill’s Olinto likens the shift in appreciating quality and variety in fresh grains to what happened decades ago with products like coffee, chocolate and beer. “Nobody remembers this, but 30 years ago, nobody was grinding [their own] coffee and there was no romance around it. It was a commodity,” Olinto says. Rosenfeld suggests thinking of the components of wheat like those of an egg. Bran is similar to egg shell—a hard, outer protective layer. Flour is the grain’s endosperm, equivalent to the egg white. This is the largest product of the milling process— about 80% of the total yield. Wheat germ or middlings is the third component, which he likens to egg yolk. This part is generally absent from grocery store flour. “All the good fats, and correspondingly all the flavor, is locked up in that germ,” Rosenfeld says. At One Mighty Mill, each of the three components is sifted into its own bin after milling. Opening the lid to the middling bin, Rosenfeld says, “This is my favorite smell. It’s got that nutty, farmy, funky smell to it. This is the ‘secret sauce’ in our baked products.” Much of the germ as well as the bran is mixed back into the flour used for One Mighty Mill’s bagels. Rosenfeld says word has gotten out in the neighborhood that fresh middlings are produced at the mill. He says local mothers and grandmothers from the Guatemalan and El Salvadoran communities send kids in search of middlings, which they mix with corn to make tortillas. “That was one of the coolest things we’ve seen. We give it to them, but they need to bring in tortillas,” Rosenfeld says. Many customers who come to Elmendorf are bread bakers looking for specific types of wheat such as Einkorn, an ancient variety, or grains like spelt. Others are taking their first plunge into baking with freshly milled grain. Asked how working these products is different from standard grocery store flour, Applebaum notes that freshly milled flour absorbs liquid more readily and will rise differently because of the presence of bran. Using 100% unsifted whole wheat will result in a denser bread with lower volume. He recommends substituting a portion into a recipe: “I say just try it. It’s going to work differently. Don’t be freaked out. It’s going to taste great.” The folks at Elmendorf also have been treated to baked goods using their products—spelt challah, a warm loaf made from Redeemer wheat, pastéis de nata made by an East Cambridge grandmother who discovered the store. 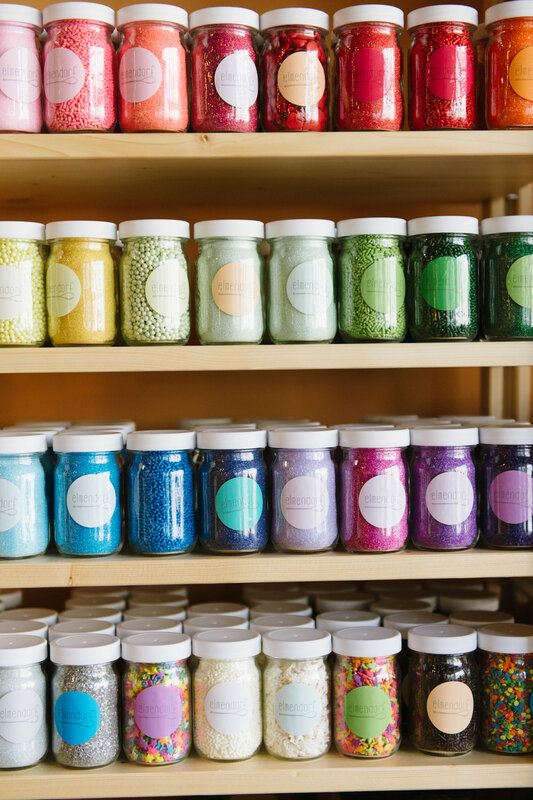 Although flavor and quality have strong appeal for bakers, Olinto sees health as the primary driver among customers buying One Mighty Mill products in the grocery store. He says that the original idea of the company was to celebrate the local roots of its products: “We started thinking about One Mighty Mill and how we might position it in the grocery store; it was very much around this idea of revitalizing local food systems. That was going to be what we lead with.” But he says they soon discovered that customers were drawn by the notion that it’s good for them, and good for their kids. For consumers, “local” and “organic” translate into “better for you.” Kids love bagels and parents are constantly on the search for foods they can feel good about. One Mighty Mill’s locally grown, freshly milled organic products fit that bill. Another market where One Mighty Mill’s approach has proven successful is with schools. On its first day of operation in September, One Mighty Mill began supplying bagels and tortillas to 20 Boston Public Schools that participate in the district’s “My Way Café” program. The initiative, launched in April 2018, seeks to increase the number of students in the district who eat fresh, healthy, meals cooked on-site. According to Olinto, the schools are located in areas where access to healthy food is more limited. “We opened on the first day of school. The first people we served were kids in some of the most at-risk neighborhoods. It’s something we’re very proud of. We’ve always wanted to feed kids as close to the mill as we can,” he says. The company has provided more than 200,000 bagels and close to 50,000 flour tortillas to the Boston schools since the start of the school year, the same products (in slightly smaller portions) that are available at Whole Foods, Roche Brothers and other retailers. One Mighty Mill’s newest young customers are even closer to the mill. After hearing about the company’s relationship with My Way Café, the superintendent of Lynn Public Schools approached Olinto about supplying bagels and tortillas to Lynn English High School. At 5am on a Monday in January, the One Mighty Mill team set up a full retail launch campaign—the same signs and displays they use at Whole Foods—at the high school, giving a new generation its first taste of a very old way of baking. This story appeared in the Spring 2019 issue.